We really think you will love our wholesale European Nightcrawlers!!! The all occasion worms. When you are looking around, you will see these European nightcrawlers marketed as; Jumbo Red Worms, Panfish Worms, Trout Worms, Leaf Worms, Belgian Night Crawlers, Euro’s, pan fish worms and several other names. Our wholesale European Nightcrawlers (Eisenia Hortensis) are a larger cousin to the Red Worm but smaller than the Canadian night crawler (which can be TOO big), making them the ideal live bait pan fish worms. 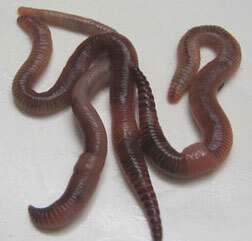 European nightcrawlers also tougher, stay alive longer and are much more active than other types of fishing worms. They are the only earthworm suitable for use as ice fishing bait; they will stay alive even after long periods of icy water submersion. European Nightcrawlers are without a doubt the best bait worm on the market, and they make excellent pan fish worms. They are great for Sunfish, Bass, Trout and even Walleye! You can keep these worms between 38 and 78 degrees with no problems, we do recommend refrigeration if you are going to store longer than 2 weeks. If you are looking for a tough fish catching bait worm, these guys are for you! Our European Nightcrawlers are all bait size (2"- 3") not bed run. Many people sell the worms by bed run (all sizes mixed). You may get 250 large ones or 1,000 small worms. But most likely you will get a mix which makes it very difficult for counting large quantities. This is ideal bait for fishing because you don’t have to refrigerate them to keep their fishing appeal. European Nightcrawlers can also be used as a composting worm, they will grow longer and fatter than its cousin the Red Worm; they will eat their weight in food every day. European Nightcrawlers like their soil more moist than the Red Worm and are not as prolific. The European Night Crawlers and the common Red Worm can coexist peacefully in a composting bin since they have similar characteristics. They are perfect for people who love to fish and garden. Shipping: Orders are shipped Monday's, Tuesday's and Wednesday's with US Priority mail or FedEx. If you select US Priority mail your package will arrive two to three days after the day shipped. Example, if shipped on Monday they should arrive on Wed or Thursday. Orders placed after 1:00 PM Central Standard time will be shipped the following shipping day. If weather conditions are hot (75 degrees or higher or cold 40 degrees or less) in your area please select next day delivery with US Postal or FedEx. If they die in transit with Next Day we will replace your order. Speedy Worm guarantees live delivery, excluding shipping on all other shipping options. Example, if you select US Priority Mail and the worms arrive dead we will replace the worms but you will have to pay for the shipping again. If you live in Minnesota, Iowa, South Dakota, North Dakota, Wisconsin, or Illinois your package will be shipped with Spee-Dee Delivery service and should arrive the next day. Parts of Illinois, South Dakota & North Dakota are a two day delivery. Please allow an extra day, should is not a guarantee of next day delivery. Guarantee: Speedy Worm GUARANTEES LIVE DELIVERY of all Bait! If you have a problem we must be contacted within 24 hours of delivery. We will replace your worms; (shipping and handling is NOT included unless you selected next day delivery), or we can credit your account. I have ordered from Speedy Worm before, and plan to do so in the future. The quality and speed of delivery has been fantastic. High quality European night crawlers and the grubs I ordered are unsurpassed. Shipping to my house took only 3 days, and the bait(s) were just as lively as if I picked them myself. I have ordered from other bait dealers before, but will only now purchase from Speedy Worm I feel sorry for people who DO NOT order from Speedy Worm because their purchase cannot match the quality of Speedy Worm. The European Nightcrawlers came when expected. And are a very active bunch of worms. We had fun with them the first few nights as they kept crawling out of their bed (box) but then we started to leave 2 night lights on close to the bed and it seems to have stopped their adventures in the night. Thank You for your help in getting a worm bed going. From Anonymous of Dexter, Michigan on 3/21/2019 . From Barry Hunt of Cameron, Louisiana on 3/19/2019 . The Nightcrawlers came within a few days from the time I ordered. Speedy Worm is the only co. I will get my worms from. The website is top rated in my book. From Sammy of ALBANY, Georgia on 3/14/2019 . From David Spencer of Benton, Illinois on 3/8/2019 . Worms arrived happy, healthy and lively. Very pleased with their condition. Chalk me up as one more happy customer. From Martin Shoopman of Colbert, Oklahoma on 3/2/2019 .